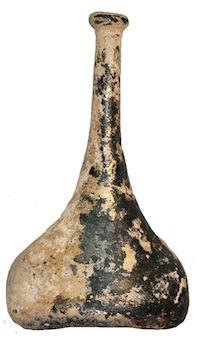 description: Wide shaped bottle with circle decoration at the top of body. Shallow "steps". Handle is fugitive, small hole to the body repaired, spreading fractures from the hole are stable, trace encrustation, old collection label to the base.